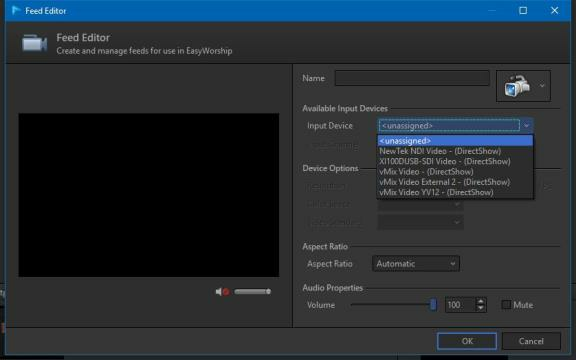 EasyWorship can be configured to be a network source for the NewTek Tricaster video mixers over your local area network. EasyWorship also has the ability to receive a video signal from another NDI source as a feed. It only takes a few clicks to set it up. Click the Edit menu at the top of EasyWorship. In the Live options change the Output Monitor to NDI Stream. Select the Output Format you wish to send to the Tricaster unit from the dropdown box. On the Tricaster you can now select the EasyWorship computer as a network input. In the Resource Area, click the Media tab and select Feeds from the Media List on the left. Click the Action Menubutton at the bottom of the Library in the middle. Select the option to Add New Feed, which brings up the Feed Editor window. Click the NDI input device to which you want to connect. Type a name for the device in the Name field. Example: iPhone 1 or Mixer. Cllick the camera icon to select the type of device (options include a Camera, Mixer, DVD player, and Misc Player). Under the Device Options, the options will auto-fill and cannot be changed. Select the Aspect Ratio you want to use. A feed can be used in many ways. I can be sent to the screen for IMAG. It can be used as a background or you can create a theme out of a feed to push the text to the bottom third of the screen, when that theme is used.